Naturally Bespoke Cakes > Blog > Naturally Colourful > New Product, sort of…. I’ve been doing a little work on our 100’s and 1000’s and I’m super excited to be telling you about these new products, well new packs anyway. You can now buy a Sampler Pack and also a Trio Pack of our 100’s and 1000’s. 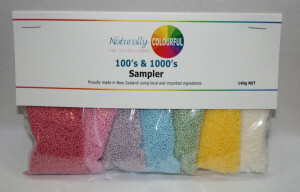 The Sampler contains 20g of each of the 7 colours, with a total weight of 140g of 100’s and 1000’s in the pack. 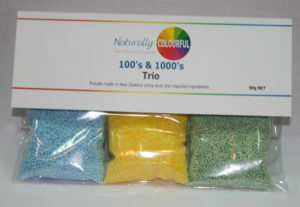 The Trio packs contain 30g each of three colours, witha total weight of 90g per pack. This comes in variations such as blue, green and yellow for a boy, or pink, purple and yellow for a girl. At the moment a popular pack contains red, white and green for Christmas. A refill bag for the 80g jar in also in the pipeline, so watch this space. I hope everyone has a safe and merry Christmas and New Year. Happy cake decorating to you all.